Last year owners of the ZX Spectrum were delighted to play ' The Legend of Traxtor '; a Match 3 puzzle game by Juan J. Martínez, which appeared as a #gbjam 3 entry and then ported over to the delightful 8bit system. 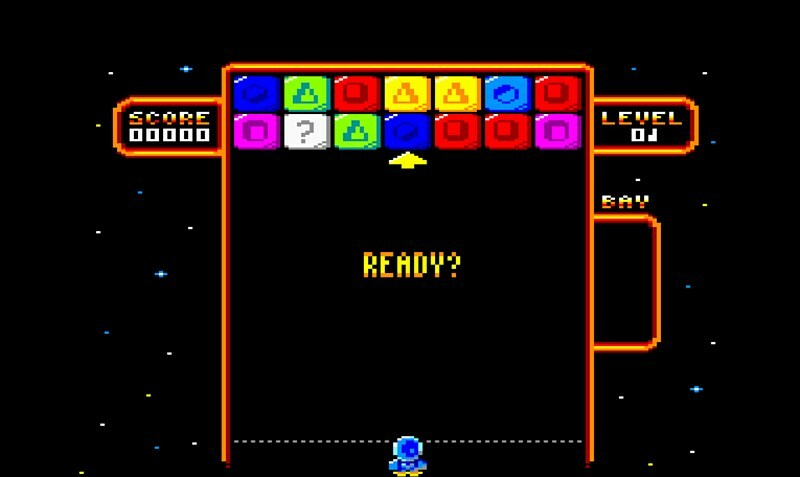 That same game that had the player matching of 3 coloured shapes and objects to obtain a high score using a special space ship, got a sequel with 'The Return of Traxtor' that was released again for the ZX Spectrum. However we've just been told, that same game developed by reidrac is coming to the Amstrad CPC 464 and current indications are it will be released tonight if not tomorrow! So far all the graphics have been redone in Mode 0 using the SPC engine, which is great because I've found some bugs and I've improved some parts so SPC will benefit from this! The original game was for the ZX Spectrum 48K and it used only beeper music, so I'll have to adapt all the songs to the AY (I plan to include tunes from both "The Legend of Traxtor" and "The Return of Traxtor"). It is a little match-3 game, but quite fun to play (IMHO); and it shouldn't take me too long to get it done. It most certainly looks better than the ZX Spectrum version and I can't wait to play it before the end of the weekend. As soon as it's available, we will let you know and post the download link below!